Bundle: Watch and Travel Case. This Swanson Jubilee Perpetual timepiece is a must to have for the modern man. Featuring a beautiful dial with large easy to read hour markers. The Swanson logo completes the design at the 12 o'clock. The 35 mm Jubilee is powered by a Miyota Japan movement manufactured, known for its precision time keeping with a Quartz battery SR626SW. The exquisite gold-tone stainless steel case is equipped with a lightweight gold-tone stainless steel bracelet for that complete look and feel. This superb jewelry watch with a stationary bezel is perfect for suit, tie and cocktail wear and is destined to be a modern classic. Great for the gym, travel or gift. Mens stainless steel watch with polished gold tone round case & stainless steel case back. Japan Movement and Sapphire Crystal Glass, Jubilee Style Bracelet with Foldover Clasp. 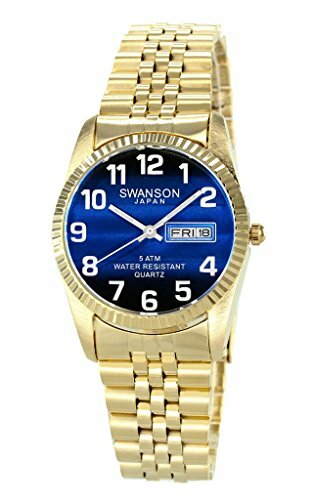 Non-directional gold tone coin-edge detailing the bezel, protective and scratch resistant mineral crystal, Swanson Japan Watches are all made with miyota quartz movement. Great Quality Adjustable Lightweight Band, 50 Meter Water Resistant - 5 ATM, Wear it with a suit or with jeans. The case is portable. It is light-weighted. It is great designed. It's all the best you can think of for your watch when travelling. Portable One Watch Case is Made of Ballistic Nylon Exterior - Case holds and protects your watch for storage or travel. Ultra Soft Interior which can Protect the Face and Band from Scratching for a Well Made Watch Case - for Watch Faces up to 38mm, High Quality Japanese Zipper, Soft interior to cushion your watch, Perfect for the new 38mm Apple Watch. If you have any questions about this product by Swanson Japan, contact us by completing and submitting the form below. If you are looking for a specif part number, please include it with your message.